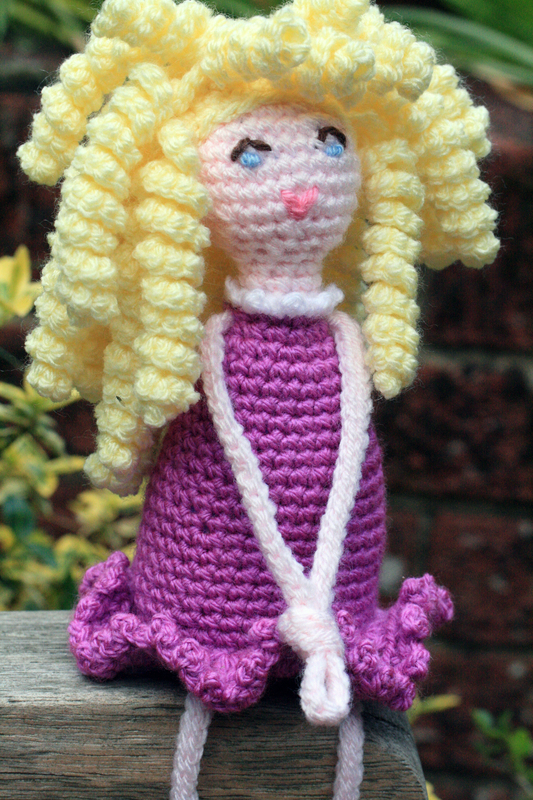 Well here she is my second attempt at making a dolly/fairy. In my excitement to introduce her to you I realised I haven’t made her wings yet! But she has been christened, the family voted for Imogen, I think it quite suits her too. She follows the same principles as Freya but hopefully is a little more refined. I took Freya in to show colleagues and the main comment was on the colour choice I had used for her face, legs and arms, I went for pale pink this time and I think that works much better. I also used a smaller hook to get a tighter finish. You may be able to make out from the photo that I made the arms and legs a bit thicker too which has made her feel more substantial. I added a little white collar to the top of the dress and a neck, this has worked well apart from the hair……………. 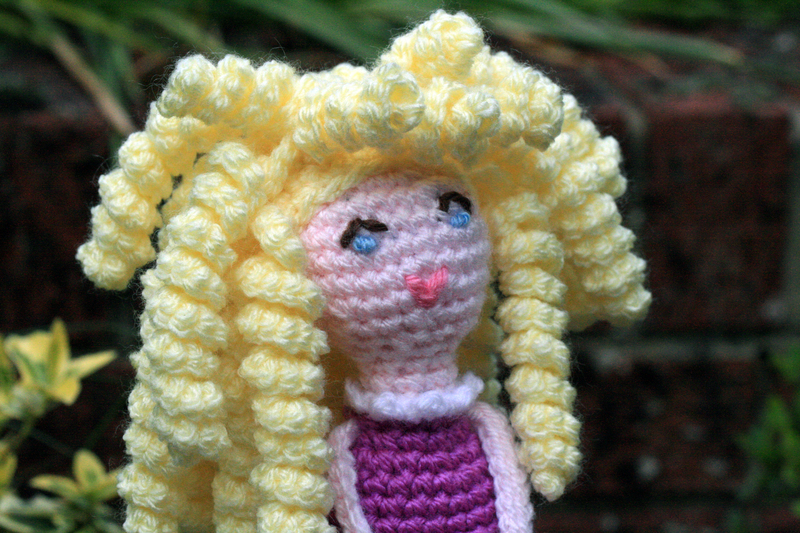 ………….which I love but all those curls are actually quite heavy and it is teeny bit of a stain on the neck. I will reduce the row count on the neck next time and see if that works. My favourite bit has to be her shoes, Freya’s shoes were flat but Imogen’s are 3D, more like actual shoes. I am so pleased with how they look and with the little bit of stuffing in them adding weight the legs hang really well. How hard is writing a pattern? After making Freya I had a couple of ideas for improvement but I didn’t take enough account on the effect these would have on other parts. 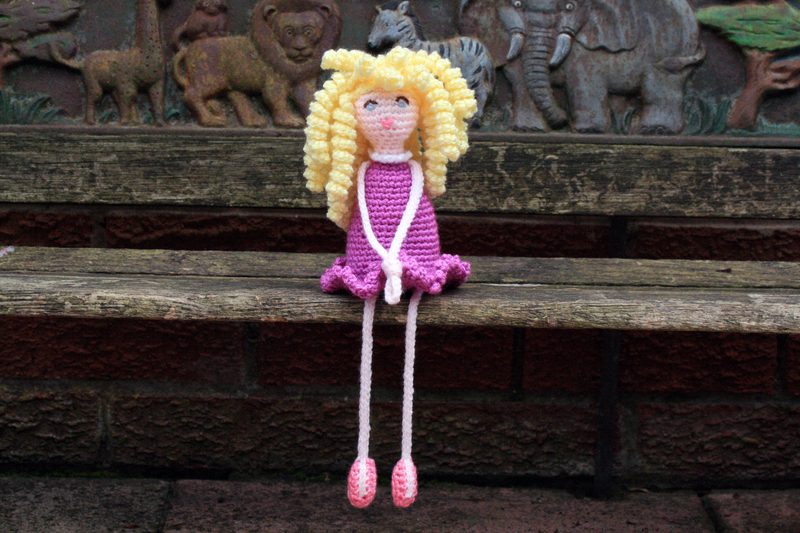 So, I have to say that Imogen is part II in my first doll making, pattern writing journey. Thank you for saying so much with just one word. She’s beautiful! I make Stuffed Piggies and have started making Stuffed Bears. Nothing as involved as your fairies, but I love the discovery of making my own patterns. There is something about piggies they are so cute too, my sister makes little pigs from felt but I don’t think she has blogged about them yet. I am still struggling with the pattern writing, not very confident that someone else could follow my instructions, I hope to share the pattern if I can ever get it to a stage where I feel happy. I know what you mean. I am just starting to share my patterns with a couple people to see if others can follow them. I would be happy to give one a try if you ever need someone else. Thanks. I’ll keep you in mind. I want to start with granny squares, so I can make sure I’m writing the patterns correctly before moving on to something more complicated. That was my first tutorial, a granny square, it took me hours as I photographed every step. I look forward to seeing how you get on. Yey, I thought so too, thank you. The first one had a wilder, fey look about her. This one is more of a prim good-girl fairy. Can’t wait to see how number 3 turns out! Thanks, I know what you mean the good and bad fairy, what will No. III be I wonder. It’s funny how some things take on a personality of their own. Wow! She looks lovely. The hair suits her. The dress and shoes are fabulous. Thank you. I am quite proud of the shoes. they are only a small part of her but I was so happy with how they worked out. CUTE:) I like her hair! Thank you, I am going to try and make it with finer yarn next time but not sure if it will lose it’s impact, we will see. Thank you so much for your lovely comment, I am preparing to start version No III over the weekend. Thank you. The hair is coming out tops with everyone, I am pleased as it took a while to do. Very cute! Your doll has the same hair as my daughter! How lucky is your daughter, I would love to have curls but alas my hair is quite straight. I LOVE her hair!! So adorable. Thanks, it took and age to make the hair but I love how it looks. Awww…She is so pretty 🙂 …. I think she is terrific. It’s not easy making dolls. I love her hair, her kind face, her shoes and the little collar on her dress. Will you be putting wings on her? You are very talented. You are so kind to offer such encouragement, we all craft away in our own little spaces so sharing with blog friends is so precious. I cannot decide about the wings, I may just leave her as a doll. Thank you, I am having fun with this project. I like her hair as it is. 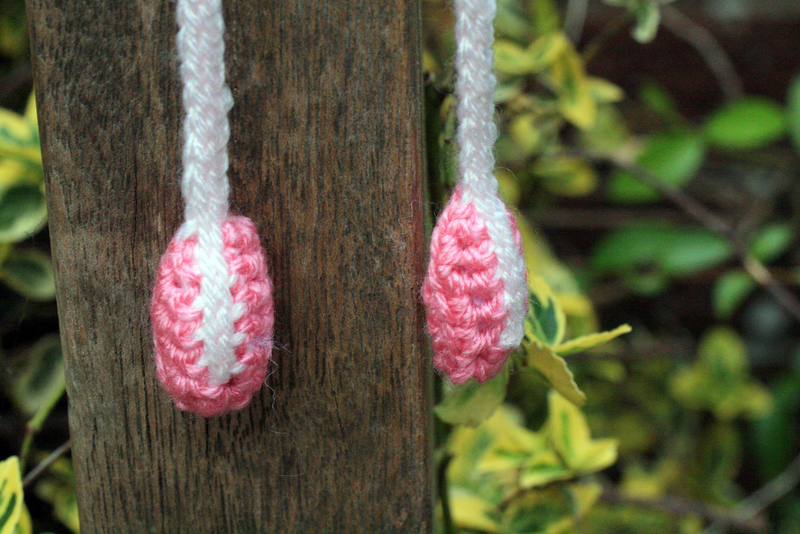 But if you want to try a lighter hair, test out #3 or #5 crochet thread…or hold together two or three strands of #10. A lot more work, but a finer texture. What a good idea, it would be much better if it could be made with something lighter weight thanks for that I will give it a go. Another amendment for Fairy Doll III. She is so cute, both your fairy dolls are adorable and I’m sure your next will be too, looking forward to seeing her, too. Thank you, I am pleased you like them, making some owls at the moment so Version III may take a couple of weeks. I’m looking forward to seeing them I use to collect any and every owl I could! She is so sweet. I love her mad hair. Thank you, simple but effective. I thought Freya was fun but Imogen is really beautiful and professional looking. Love her hair. How did you do it? It is really simple, you just make a chain whatever length you want then and work your way up alternately 3sc, 2sc, 3sc, 2sc into each chain, it curls on it’s own. Thank you for your kind words, I need all the support I can get to keep at it until I get it right. It takes so much longer to make things when you have to keep stopping to write it all out, but thanks for the encouragement I will definitely keep at it until I get it right. I simply love her. Her hair and shoes are especially fabulous! Thank you, her shoes are my favourite bit, making all the ringlets for the hair took as long as the rest of her but was worth the effort.